Beneficial Ownership: Is Forcing Public Transparency Upon Overseas Territories A Mistake? 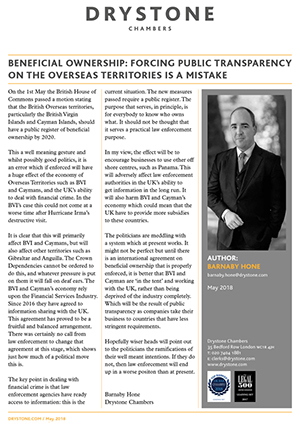 In this short commentary piece, Barnaby gives his view on the recent motion passed by Parliament stating that the British Overseas territories must have a public register of beneficial ownership by 2020. What effect will this have on the UK’s ability to fight financial crime? Click here to access the article.